As we enter the 2nd year of the US Financial Economic Crisis that started in August of 2007 with the sub-prime lending meltdown, the impact on the economy and the average American has been devastating. Economy.com is predicting that by the end of 2008 over 2.8 million US households will either be in foreclosure, be forced to give their house over to their lender and move out or sell their home for an amount lower than their actual mortgage balance. 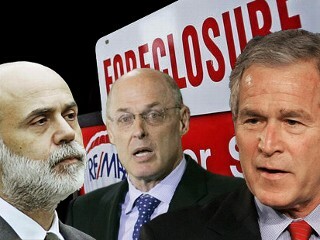 And Federal Reserve Chairman Ben Bernanke said that mortgage defaults wouldn’t harm the US economy! So far besides foreclosures being at an all time high, we’ve had the collapse of practically every sub-prime lender out there including New Century Financial, which was the largest subprime leanding company in the United States. Even regular lenders like American Home Mortgage and Countrywide Financial Corporation were effected. AHM filed bankruptcy and CFC narrowly avoided it with a last minute loan. We also saw the collapse of many of the largest companies in the world in the financial sector. In March of 2008, Bear Sterns, one of the largest investment banks in the world was forced to sell itself to JP Morgan and Chase for a fraction of what it traded for prior to its collapse. The source? Investing in a wide variety of high risk investments, many of which was tied to the sub prime lending crisis. In September of 2008, the Federal Housing Finance Agency announced that it was taking over Fannie May and Freddie Mac. This was done because there were huge concerns that due to the two companies’ exposure to the mortgage market, increasing loan defaults could result in the companies failing to meet its obligations and commitments. Merrill Lynch was forced to sell to Bank of America due to its massive losses from the subprime lending market. Lehman Brothers was forced to file bankruptcy due to is losses from the mortgage crisis. Then it was announced in the same month that AIG – American International Group, which was the 18th largest company in the world was at serious risk of going out of business as well. Despite the fact that most of the companies’ business units were healthy, one business unit that invested in debt security derivatives gone bad due to the subprime meltdown threatened to bankrupt the entire company. The company was saved by an emergency federal loan bailout in exchange for a huge stake in the company to the US government. So what lessons can we as average investors can learn from this crisis? Here are 5 lessons for you. 1. Only buy a house you can afford. Robert Kiyosaki is right. A house is not an asset unless it is making you money. If you are not collecting more rent than you are paying in mortgage, (chances are in your personal residence you aren’t collecting any rent at all), your house is a liability. There is no guarantee a house will always appreciate in value, as we have all learned the hard way from this crisis. 2. There is no such thing as a guaranteed retirement. If your company files for bankruptcy you can kiss your pension goodbye. Think it can’t happen to you? Do a search for an article written in Time Magazine called The Great Retirement Ripoff What would you do if your pension check bounced? Are you prepared to have to go back to work in your 60’s, 70’s, or even 80’s? 3. Be wary of 401K plans. 6 months ago AIG traded for $43 a share. Today it trades for $2 a share. Your 401K plan mutual funds are investing in companies like AIG. If a market correction occurs, you can see your portfolio take a nosedive. In addition, although many companies offer to match your investment in a 401K plan up to a certain amount, their “match” is in the form of company stock. Imagine how all the poor souls at AIG whose 401K plans are loaded with $2 a share company stock are feeling right now. 4. There’s no such thing as a “safe secure job.” Many of the largest companies in the world are laying off people by the thousands. At my 2nd to last job literally a few months after I left, my entire business unit was laid off. At my last job again a few months after I left, my entire business unit was once again laid off. 5. You MUST have a Plan B. If you get laid off tomorrow and it takes 6 months to a year to find a job paying what you make right now, how long can you make it before you are out on the street? If your 401K takes a huge dip right before you are expected to retire, what are you going to do? If your pension gets wiped out how are you going to survive? If you lost your job, your 401K plan crashed or your pension check disappeared do you currently have the financial wherewithal to survive? If not, you need a Plan B. You need a business that can produce for you up front immediate income, leveraged income that is based on the efforts of others, not yourself and residual income that continues to come in based on work done years ago. To learn more about such a business visit http://www.createthelifestyle.info today and get started on your Plan B!